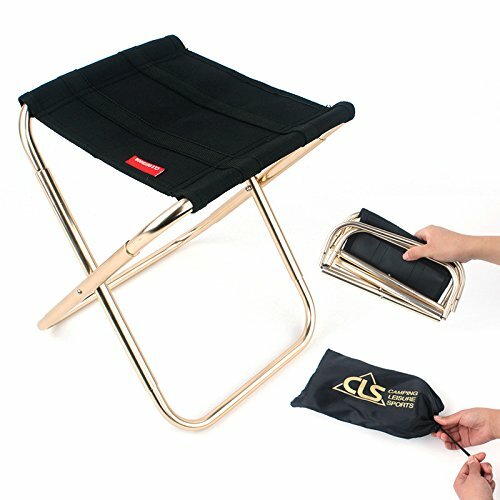 Dengwenxiang Portable Folding Stool for Camping and Sports Portable Chair for Camping Fishing Hiking Gardening and Beach, Camping Seat with Black Bag by Dengwenxiang at Kerinci. MPN: PO-12. Hurry! Limited time offer. Offer valid only while supplies last. Please look for Dengwenxiang when you buy! ! ! Recently, a shop called AIDDKK sells our products. Please look for Dengwenxiang. We will provide you with the best quality products, thank you.This folding stool is light and compact. It can be folded to fit your backpack size so you can easily carry it. Lightweight, you can carry it to all outdoor activities or activities. Take a short break after a long hike or during a long wait for a big sale! Durable and finally built: The seat fabric is made of high-quality, strong 1680D Oxford cloth. The frame is an aircraft grade aluminum alloy frame. Supports up to 250 lbs (115 kg) of sitting position.600d Oxford cloth, frame, hard steel tube, high-grade plastic fittings. Versatile: The Yolafe camping chair is suitable for a variety of outdoor and indoor activities such as bedrooms, dormitories, offices, swimming pools, patios, terraces, beaches, courtyards, games, picnic parties, camping, barbecue/grill, fishing, mountaineering. 100% Money Back Guarantee: We are very confident in the quality of our products and we are sure you will like this folding chair. However, if you are not satisfied with this product, you can contact us for replacement or full refund at any time. Then no risk, please rest assured to buy! If you have any questions about this product by Dengwenxiang, contact us by completing and submitting the form below. If you are looking for a specif part number, please include it with your message.